Walk-on grid girls were axed from Formula One today as the motorsport followed the move within darts to get rid of glamour women. 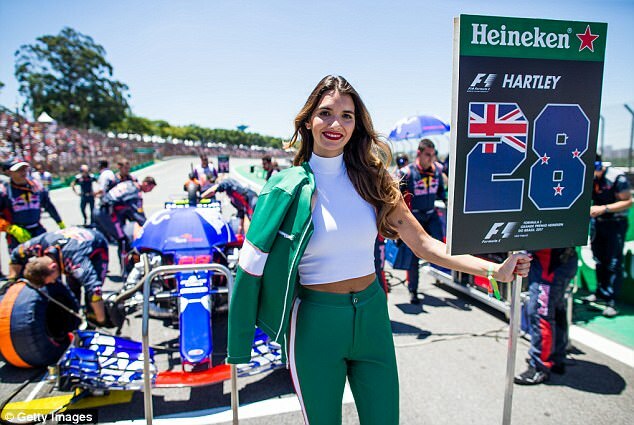 F1 bosses said they will no longer use grid girls from this current season which starts in Australia in two months' time because it is not in keeping with their 'brand values'. The move mirrors the Professional Darts Corporation's decision last week to end the long-established practice of women escorting male players to the stage. And it comes in the wake of the growing row over sexual harassment following accusations levelled at disgraced Hollywood film mogul Harvey Weinstein. The changes will also apply to other races which take place on grand prix weekends and will come into play from the Australian Grand Prix in Melbourne on March 25. Sean Bratches, F1 managing director of commercial operations, said: 'Over the last year we have looked at a number of areas which we felt needed updating so as to be more in tune with our vision for this great sport. 'While the practice of employing grid girls has been a staple of Formula 1 Grands Prix for decades, we feel this custom does not resonate with our brand values and clearly is at odds with modern day societal norms. London-based charity the Women's Sport Trust had previously put pressure on F1 to drop its walk-on girls along with boxing and cycling, after the decision in darts. It tweeted last week: 'We applaud the Professional Darts Corporation moving with the times and deciding to no longer use walk-on-girls. Motor racing, boxing and cycling... your move. The announcement, however, was met with backlash, with fans voicing their dismay on social media. Many were infuriated by F1's claim that the decision was made due to the 'brand values' and took their frustrations to Twitter. 'The Halo doesn't resonate with the fans values, remove that as well', wrote one user - referring to the safety cockpit device which has become mandatory ahead of the new season. The sport was also criticised for taking the glamour away, with some claiming grid girls are an important part of a race weekend. Marco Conradie wrote: 'It's as if F1 is doing everything possible these days to remove the glamour and excitement from the sport. Model Kelly Brook, 38, who used to work as an F1 flag girl, told ITV's Loose Women: 'It's a well-paid job. It's one of the best jobs I ever had. Jade Slusarczyk, a Sky Sports walk-on girl in the snooker, was accused by a listener of BBC Radio 2's Jeremy Vine show that she needed 'education' to understand why the job is offensive. 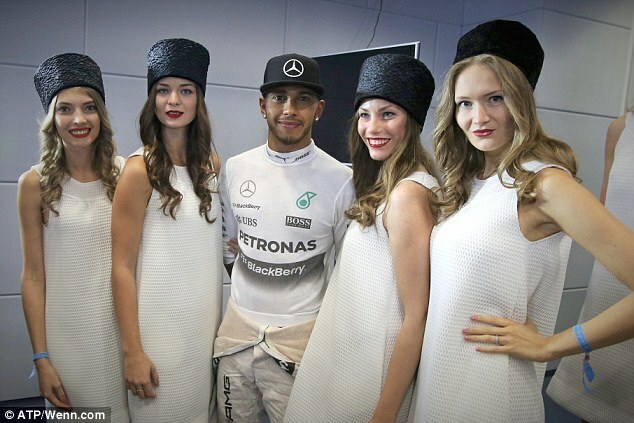 But Doctor Who actress Ingrid Oliver tweeted: 'First darts girls, now F1 girls. 'Male decision makers from uber-male sports disciplines renouncing objectification of women, whether cynical PR move or no, feels huge. WHICH OTHER SPORTS COULD BE HIT NEXT? Darts suffered a similar backlash after the sport announced walk-on girls will no longer be used by the PDC following talks with broadcasters. Women have accompanied players onto the stage for some years— something that has been regularly criticised — and the PDC decided to act despite many calling for the decision to be reversed. The move has triggered a petition to reinstate the girls in darts. As of today it had more than 36,000 signatures. The PDC previously said it made its decision to end the practice of walk-on girls after receiving 'feedback from our host broadcasters' and pressure from fans. 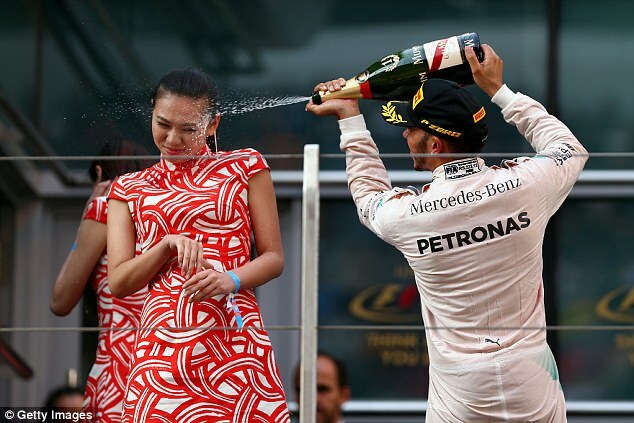 Other sports still employ glamorous women under the guise of entertaining the crowd before and during events. Boxing and UFC both have 'ring girls', who let the crowd know which round is coming up by holding up numbered cards, generally while wearing revealing outfits. Cheerleaders are prevalent in American sports, with teams and franchises having their own professional cheerleading squads. Cycling is another sport which traditionally uses 'podium girls' to pose with race winners and plant a kiss on their cheeks. However, the Tour Down Under scrapped the use of podium girls last year and the Tour de Yorkshire instead chose to celebrate successful local businesswomen. Cyclist Peter Sagan caused uproar in 2013 when he was pictured pinching the bottom of a podium girl after a Tour de France stage. The 2018 F1 season begins with the Australian Grand Prix, where Lewis Hamilton will begin his bid to become a five-time world champion. Darts supremo Barry Hearn has hit out at TV bosses after walk-on girls were axed from darts at televised tournaments. It emerged last week that the sport's famous girls will no longer be used by the Professional Darts Corporation (PDC) following talks with broadcasters. And Hearn, the PDC's chairman, has claimed the decision was out of his control — while he also insisted he hasn't got a 'problem' with the walk-on girls. Hearn said: 'It's out of my control. 'We're living in changing times — the PC brigade, the liberal brigade are out in strength and it's causing changes in sport everywhere we look and it's probably going to get worse. 'I have no personal problems whatsoever with walk-on girls in darts. None. They've been there from the beginning. 'I think the girls are great, they get paid and it's a job for them. I haven't got a problem. 'But I do have a big problem in the age we live in – I've got the BBC, ITV and Sky, my three UK broadcasters, saying to me this is not part of their editorial policy any longer. They do not want to show the walk-on girls on television.